Lakeside produced a remarkable comeback to beat reigning Champions Sheffield 52-38 in their own back yard. The Hammers found themselves ten-points down with six races gone, struggling with conditions caused by a heavy downpour 15 minutes before the scheduled start time. But the Purfleet outfit rallied together and began dominating the starts for the remainder of the meeting. And that proved pivotal in their fight back as they sealed eight heat advantages in the last nine races. I’m so proud of all the riders; they all put in a terrific shift and even when we were a fair bit behind early on they never panicked. There’s a great belief within the team and they’ve all got the right attitude. He was supported superbly by Lawson who recovered from a retirement in his first outing to win three of his next four while No.1 Nick Morris also went unbeaten by an opponent in his last three rides. Ben Morley won two of his three outings while Kyle Newman and Zach Wajtknecht both chipped in with five a-piece. Kyle Howarth 10, Charles Wright 9, Lasse Bjerre 6+1, James Shanes 6+1, Todd Kurtz 3+1, Broc Nicol 3+1, Georgie Wood 1+1. 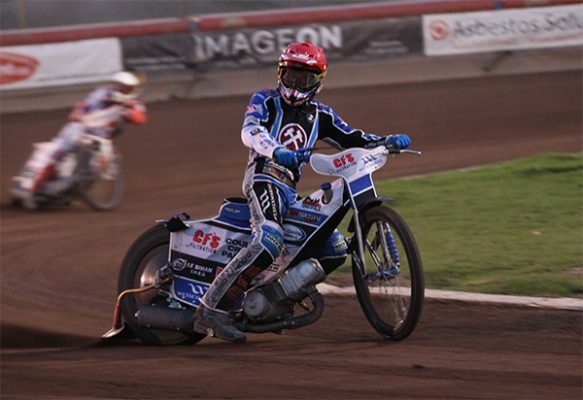 Adam Ellis 13+2, Richard Lawson 11, Nick Morris 8+3, Ben Morley 6, Kyle Newman 5, Zach Wajtknecht 5, Alfie Bowtell 4.